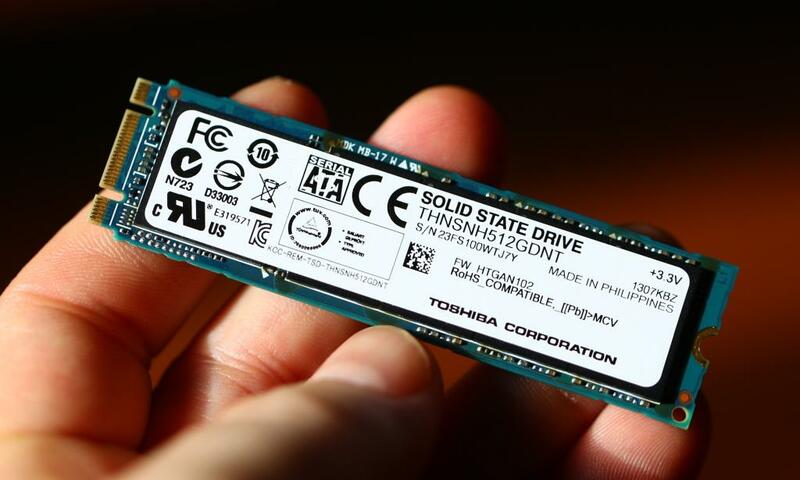 By now, many are aware that there is a new SSD standard known as NGFF or M.2. NGFF is actually a slang term that started the process rolling and means ‘next generation form factor’. If you have been following our reviews as of late, you would have also learned that, within the M.2 standard, there are two separate SSD configurations. On one hand we have SATA M.2 SSDs capable of 6Gbps speeds above 550MB/s while, on the other, native PCIe M.2 SSDs can reach as high as 2GB/s through the use of four PCIe 2.0 lanes. The easy way to differentiate between the two is by the interface, SATA having two notches whereas native PCIe has one. 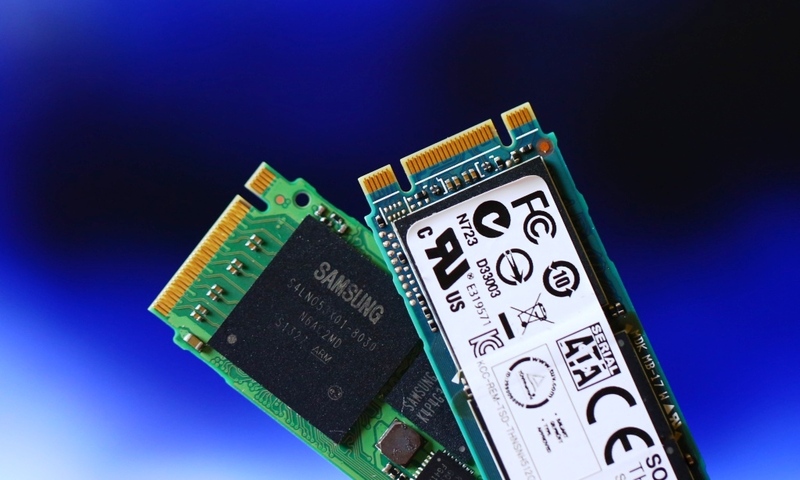 Up to this point, we have reviewed one of each with the ADATA AXNS360E 128GB SATA M.2 SSD reaching speeds of 550MB/s while the Samsung XP941 512GB PCIe M.2 SSD more than doubled that at 1.2GB/s. The important thing for all to remember is that, regardless of the speed, the typical user will never be able to visibly observe any difference whatsoever between either SSD. The typical users lightning fast SSD experience is the result of disk access times which are the same between most SSDs, whereas the new native PCIe transfer speeds will be a godsend to media professionals who transfer hundreds of gigabytes of highly incompressible media daily. 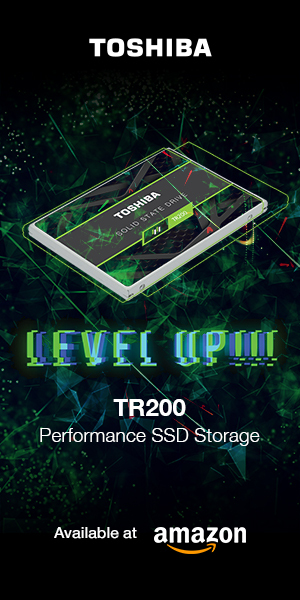 Known as the HG5d Series of Toshiba solid state drives, the cSSD (or client SSD) can be found in PC systems worldwide, however, is not available through retail sales. The HG5d cSSD family is comprised of 2.5″ notebook, mSATA and M.2 form factor SSDs with capacities of 60, 128, 256 and 512GB. 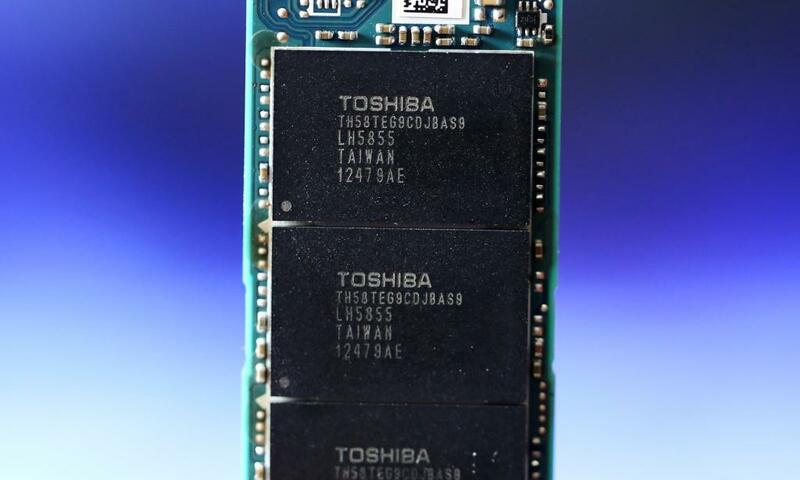 All speak to low power consumption, three-year warranties applicable only to manufacturing partners, and all take advantage of Toshiba’s newest 19nm Toggle Mode 2.0 MLC memory. The M.2 family of the HG5d cSSD is a SATA M.2 SSD and listed performance is variable, depending on capacity. 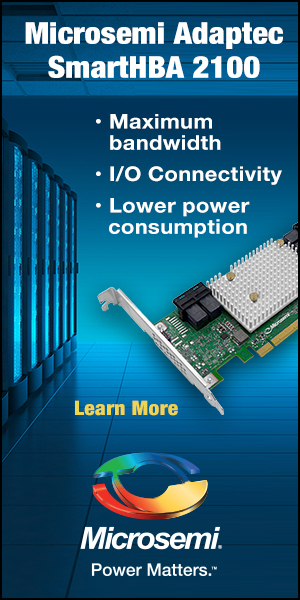 Our sample 512GB M.2 SSD can reach 534MB/s read and 482MB/s write with 90KIOPS read and 35KIOPS write. 128 and 256GB capacities have the same read performance but write speeds are listed at 471MB/s with read IOPS a bit lower at 80K. 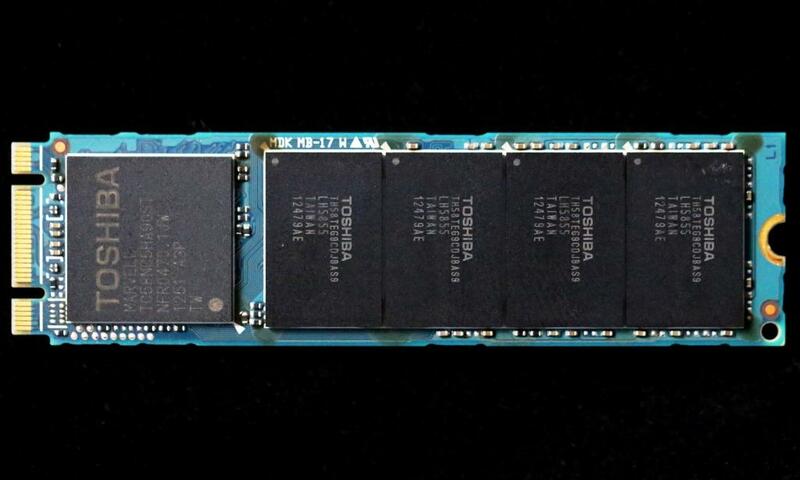 The Toshiba HG5d Series SATA M.2 cSSD contains the Toshiba TC58NC5HA9GST eight channel controller and eight modules of Toshiba Toggle Mode 2.0 NAND flash memory, each module being 64GB in capacity. 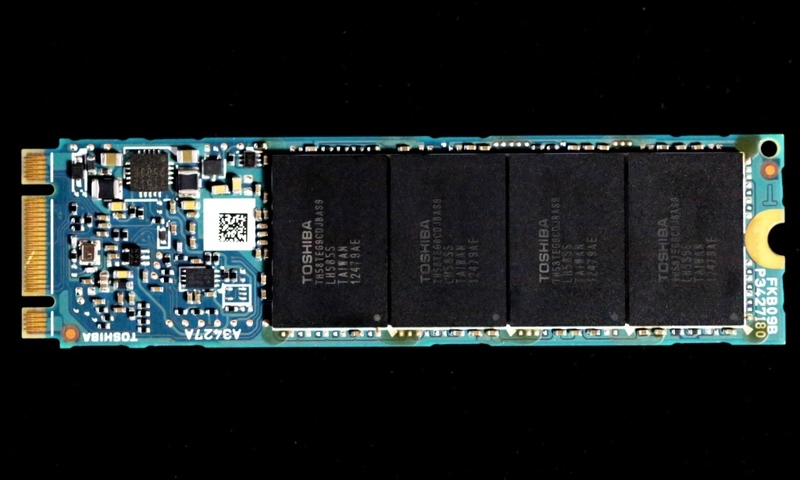 Although the hardware of this controller is manufactured by Marvell, Toshiba engineering and firmware expertise plays a large part in its success and this is one of the first times we have seen a Marvell controller that did not use some type of DRAM cache. Although the total RAW capacity if this M.2 SSD is 512GB (64×8), the total available space for the user after formatting is 477GB. hmm… too slow. Really M.2(NGFF)’s release? It’s likes only swapping SATA6G and PCIe I/O. What the hell are you talking about? SATA Express is hardly “here”. I’d love for you to show me some laptops that contain SATA Express drives. Yea, didn’t think so. And SAS? Really? If SAS was going to make it into mainstream computers, it would have happened AGES ago. As for your shot at this article (and site), you will be hard pressed to find another site dedicated to SSDs with as much history as this forum/blog. PCIe is where it’s at, bro-sees. 2. SSD are already sacrificing most important characteristic – RELIABILITY and DURABILITY chasing still unnecessary performance. My bad… Antey, Not Eric. Very sorry for the mixup, Eric. Unfortunately I am not aware of anywhere for retail sales. RAMCity would have been my best guess as well. It is a M.2 client (non-retail) SSD. 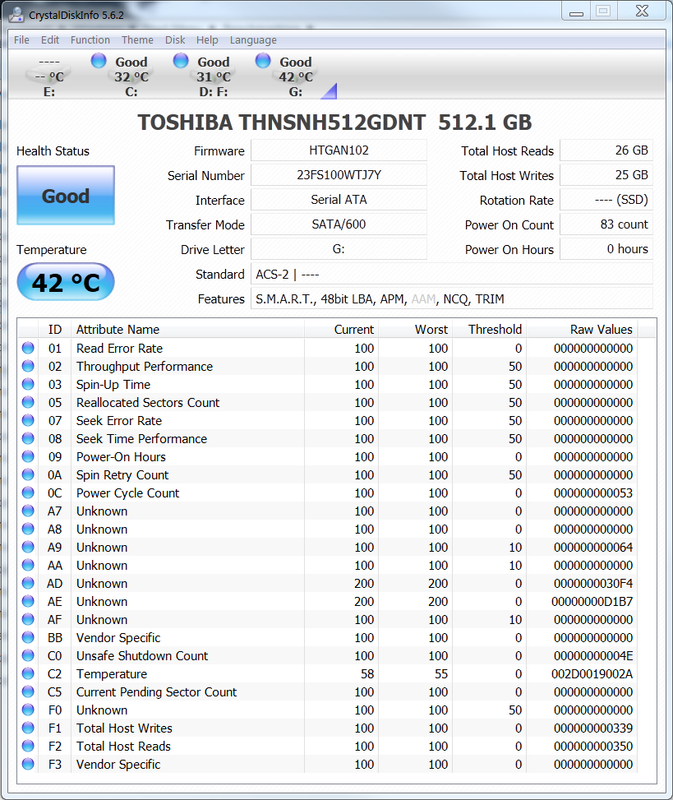 This is pretty much the best SSD for a Samsung Ativ Book 9 940X3G eh? Yup…it seems to be a SATA M.2. Availability is the next issue. At retail, I have ONLY seen Intel M.2 SSDs listed on Amazon and Newegg in very small amounts. I might ask RAMCity if they can get you ANY SATA M.2. What exactly are you looking for, simply a larger capacity?